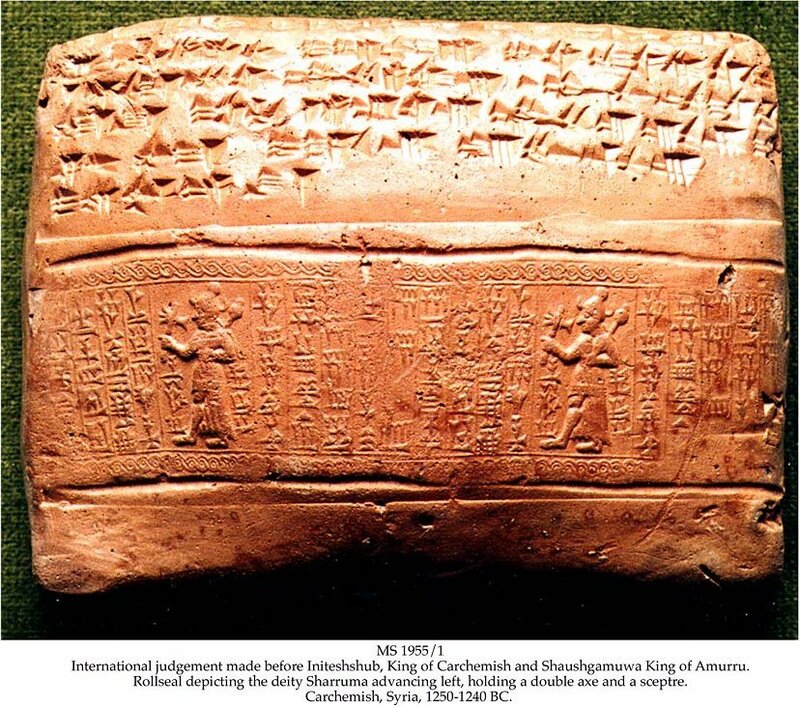 Description	 MS in Akkadian on clay, Carchemish, Syria, 1250-1240 BC, 1 tablet, 8,2x10,2x3,2 cm, single column, 15+5 lines in cuneiform script, with seal impression rolled across the whole of the tablet, showing the deity Sharruma advancing left, holding a double axe and a sceptre. 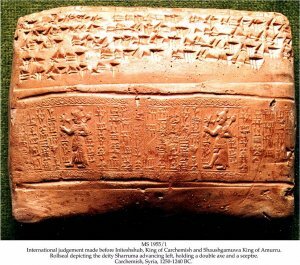 Context	 The present tablet is one out of 11 tablets concerning the divorce and judgement of Queen Piddu, involving 3 of the Kingdoms of the time, as well as the Hittite empire under King Tudkhaliash IV (ca. 1265-1220 BC). Commentary	 The kingdoms of Ugarit, Amurru and Carchemish at the North-east corner of the Mediterranean, were squeezed between the 3 great powers of the 13th c. BC, the Hittite empire, Assyria and Egypt. The present tablet illustrates the tensions among the kingdoms that fills in a bit of the picture of the upheaval to come at the end of the Bronze Age and the beginning of the Iron Age, leading to the fall of the Hittite empire to Assyria and the following Trojan war as described by Homer. Published	 Analecta Orientalia, 48, Roma, Pontificium Institutum Biblicum, 1971: Loren R. Fisher, editor, The Claremont Ras Shamra Tablets, pp. 11-21. The seal is published in Ugaritica III, p. 24. Exhibited	 1. The Claremont Ras Shamra Tablets, at the Institute for Antiquity and Christianity, Claremont, California, 1970-1994. 2. "Preservation for access: Originals and copies". On the occasion of the 1st International Memory of the World Conference, organized by the Norwegian Commission for UNESCO and the National Library of Norway, at the Astrup Fearnley Museum of Modern Art, Oslo, 3 June - 14 July 1996.